In this book, I argue that electoral candidates, by emphasizing or deemphasizing economic issues in campaign messages, condition voters’ willingness to hold governments responsible for past economic performance. 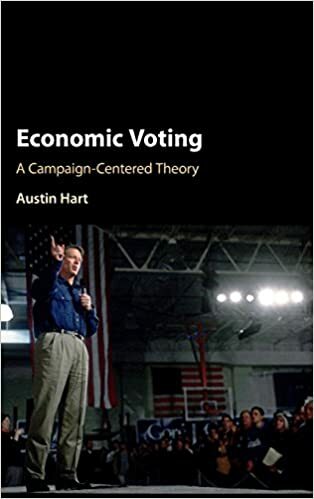 Extant economic voting theory, by contrast, holds that candidate strategy has little influence over when and to what extent economic voting occurs. I test my campaign-centered theory against this conventional wisdom by analyzing the effect of televised economic ads on vote choices in eight national elections in six countries. I find that the effect is systematic and generalizable. More broadly, by reevaluating the psychology of economic voting in light of extensive research on psychological priming, I help explain a broad class of elections the conventional model treats as anomalous. This study reevaluates the classic “media priming” hypothesis, which argues that, when news coverage raises an issue’s salience, voters align their overall evaluation of the president with their assessment of him on that issue. Experimental studies of priming typically show increased correspondence between overall and issue evaluations after exposure to news. This increased correspondence is identified as priming. However, this phenomenon is also consistent with another explanation. Precisely the opposite, the “projection” hypothesis argues that, after exposure to an issue in the news, voters align their opinion on the issue with their assessment of the president’s overall performance. Existing experimental studies cannot rule out this alternative explanation, so we conduct a survey experiment to evaluate the priming and projection hypotheses jointly. Despite recent evidence that projection is the true underlying effect, our findings support the priming hypothesis. This represents the first unconfounded experimental evidence of media priming. This project (with Joel Middleton) was funded by a competitive grant from the TESS program (Time-sharing Experiments in the Social Sciences). The paper has been presented at the APSA conference and to the Analyst Institute in Washington and was published in the Journal of Politics. Water poverty disproportionately affects women. In Africa alone, some estimate that women lose over 40 billion working hours per year harvesting water. Although policy makers and IGOs suggest that increased water access will improve women’s outcomes in education, economics, and security, these claims have not been tested rigorously. This paper aims to fill this gap by evaluating the effect of water access on girls’ educational attainment. Based on analysis of longitudinal data in Tanzania and Uganda, we find that gaining access to proximate water increases educational attainment among boys but not girls. (This project is coauthored with Mukhaye Muchimuti). Correcting the relative lack of attention to the revenue side of public finance, this article examines to what extent globalization constrains partisan tax policy. I hypothesize that political ideology is still a good predictor of taxation in the neoliberal era. I advance this argument against the prominent globalization thesis: that global economic pressures have supplanted political ideology as the driving force of revenue policy. While research in developed democracies identifies a resilient link between partisanship and policy outcomes, the impact of the drastic neoliberal transition on partisan policymaking in the developing world remains poorly understood. Using time-series-cross-section data to evaluate partisan taxation in South America, I find that partisanship is a reliable indicator of tax revenue in the neoliberal era. Counterintuitively, however, the pro-market right generates more tax revenue than the interventionist left. I argue that this previously unexpected revenue gap is driven by ideological concerns for equity versus growth.